So when you’re a permanent Australian-slash-US citizen, on the opposite site of the globe from your Thanksgiving roots, and too buggered from unpacking moving boxes (from Melbourne) to cook the whole turkey and trimmings, how do you celebrate in Sydney? Well, you go to Meetup.com, find a bunch of other American expats in town who are equally lazy, and you have a picnic in Cremorne Point. Which is exactly what we did, Sarah and I committing to bring two sides as our contribution in what would be a pot-luck smorgasbord of mystery offerings by strangers. Our first task was baking a batch of sweet Cajun corn bread, gleaned directly from Paul Prudhomme’s Louisiana Kitchen cookbook and my failsafe recipe for any occasion remotely hinting of an American influence. Another favourite is bourbon sweet potatoes, a dish that tastes far better than it sounds, but it being a full work day we were short of prep time, so I grabbed a quick-and-easy dish of caramelised corn with fresh mint from the New York Times. Rarely are dishes this good so easy to make. We were running an hour late, as you do, when we got to Cremorne Point and looked for signs of life. As soon as we started walking towards the grass, a whole crew of bag-toting Americans were walking towards us. Were we too late? Nup. It turned out that two separate groups had formed, with one sitting down at the wrong part of the park. 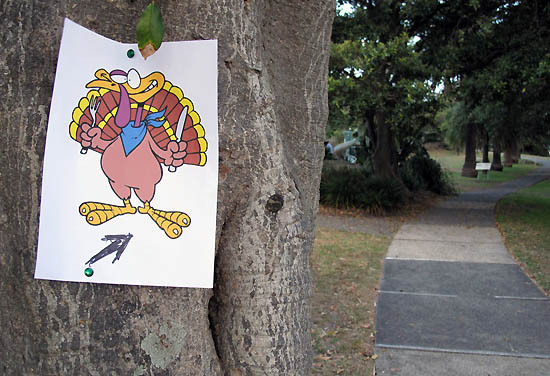 So we walked with the wanderers up some steps and saw a string of turkey posters attached to trees and followed the trail. What eventuated was what appeared to be approximately 100 Americans sprawled cross-legged in a park. Alongside the gathering was a large picnic table teeming with dishes, from the requisite turkey to sweet potato pie, wild rice, macaroni and cheese and other things like broccoli and couscous that weren’t exactly classic Thanksgiving fare, but which hit the spot anyway. We sat on the ground with our piled-high plates, watched the skies darken around the Harbour and Opera House, and gave dirty looks to the minor birds inching ever brazenly towards our meals. Not bad for an impromptu gathering. Sadly, though, I don’t get off work for Thanksgiving in Australia, and I was tired from a long day (and with another workday looming). So with the added impetus of flashes of lightning appearing behind the Sydney skyline, Sarah and I hopped onto the Vespa and raced home before the rains threatened. On this Thanksgiving, we were thankful for a good no-fuss meal, and for not getting soaked. Ok, so I want to make a couple of disclosures here. First, I’m freelancing at Vogue Entertaining + Travel as we speak, so editing at News Magazines makes it easy to be on top of the goings on in these parts. No, sadly, I’m only unveiling public information (albeit imminently); no secrets or juicy goss. I like my work, so I’m not about to throw it all in for the sake of two-minute blogging glory. And secondly, I was a failed contestant for the first season of MasterChef, a humbling story that I’ll have to elaborate on at some point. I know, nothing earth-shattering, but I like to keep my transparency as effective as a see-through negligee. So now to the nitty gritty. Today’s breaking news is that News Magazines has announced it will be launching MasterChef Magazine, in what’s been a big week for the MC after this week’s earlier report that Gordon Ramsay will head up the forthcoming US show. Trudi Jenkins, who’s heading up the launch, was my boss when I was chief sub-editor at .delicious magazine, which she also launched. She’s a smart operator, so I’d expect great things from the mag. FremantleMedia Enterprises (FME), the commercial and brand extension arm of FremantleMedia, and News Magazines, Australia’s leading publisher of food, lifestyle, fashion titles, today announced the launch of the ultimate food and lifestyle guide for home cooks and lovers of great food and dining – MasterChef Magazine. Embracing the tremendous success of the MasterChef Australia television program and Australia’s best food writers and editors, MasterChef Magazine will launch as a monthly glossy publication in May, 2010. MasterChef Magazine will provide inspiration and aspiration to a food-loving and interested audience, capturing the key pillars of the MasterChef brand. “Trudi Jenkins, editor-in-chief of Delicious and Vogue Entertaining + Travel, will be leading the editorial team for this new, friendly and celebratory publication,” says Ms Hook. “I’m excited to be working with FremantleMedia on the launch of MasterChef Magazine,” says Ms Jenkins. “We will have exclusive access to key personalities and elements of the television show. We will also feature national and international chefs as well as incorporating lifestyle and travel stories,” says Ms Jenkins. “This addition to our magazine portfolio together with Taste.com.au, Australia’s leading food website, further solidifies our dominance of the food category and offers our advertisers an unparalleled opportunity to access a highly engaged audience,” says Ms Hook. News Magazines joins an already strong portfolio of partners across the MasterChef Australia licensing program. FME recently announced a partnership with Groupe SEB to launch the Tefal MasterChef cookware range, and Random House will release The Cookbook – Volume 1 in December. To further complement the MasterChef brand, the MasterChef Masterclass DVD is now on sale. MasterChef Australia is a FremantleMedia Australia production for Network Ten. Series 2 of MasterChef Australia will premiere in May, 2010.